The smaller federations of Fédération Internationale des Échecs (FIDE) are often stuck with a dilemma. Most are too destitute to travel and play top flight competition, yet when they do play top flight competition, the encounters are so infrequent that they do little to help sustained chess development. Stuck within small federations, players must be content with local competition, an occasional regional tournament and for a chosen few, a trip to the Olympiad every two years. Most times these trips come after several appeals from the national sports body or from private corporations. Most of these companies do not see chess as a sporting activity that they would have a long-standing sponsorship with. When opportunities are few, chess players must take advantage of every opportunity in preparation. For Africa, chess often has to compete with other sporting activities for funding. There are African federations such as Egypt that invests in their players by supporting their efforts abroad. Both of Egypt's Grandmasters (Ahmed Adly and Bassem Amin) are less than 20 years old and travel to the Middle East and Europe to compete. The other three African GMs are based in France. Chess has had less fortunate south of the Sahara. Many federations struggle to pay their FIDE dues and have to rely on the generosity of sponsorship to get plane tickets for Olympiad tournaments. There are many instances where the federation does not have a permanent office to conduct their affairs. Part of the promises made in the last FIDE campaign was to ameliorate these issues in African chess, but of course African federations have to chart an aggressive course to be taken seriously. There is one other issue… good results help to attract sponsorship. However, how does one get good results if they cannot get the experience? Recently the Botswana Women's team traveled to Yekatrinberg (Ekaterinberg), Russia to compete against nine other women's teams in the 1st World Women's Team Chess Championship. The following teams would join Botswana: China, Russia, Ukraine, Georgia, Germany, Poland, Armenia, Vietnam and the Czech Republic. This tournament was the first of its kind. Certainly the Botswana team would not be favorites, but had high hopes riding on the shoulders of experienced players WGM Tuduetso Sabure, WFM Boikhutso Mudongo and current national champion, Tshepiso Lopang. Ontiretse Sabure has also been an Olympian. Only Sylvia Pilane Masego was getting her first taste of international competition. What would ensue was a nightmare. A vivacious Tuduetso Sabure enjoying the rest day. Photo by WGM Elmira Mirzoeva. The team would proceed to lose every single game of every single match against the other nine teams. The total would be 36 losses, 0 wins, 0 draws. Few of the games showed preparation and many were decided in the opening on basic tactical oversights. The Botswana team has a combination of Olympiad players (and have been successful), so they at least somewhat familiar with this level, but they were not used to facing strong competition every single round. In the Olympiad, such teams may face the strongest opposition in round #1 only. As the Botswana losses piled up in Russia, the chess media began running jokes about the team saying that they were merely "feeling good to be there," were "tourists" and that playing them is equivalent to getting a "bye." It must have been embarrassing to lose games, but in one of the ChessBase reports, the team was shown on the rest day in a number of poses that raised questions about their seriousness in the event. 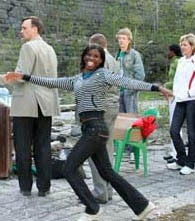 (see photo above) The report showed Botswana players frolicking in the sun and the article mentioned that they signed autographs for local school kids. Can one be overly harsh on the Botswana team for this debacle? Perhaps, the federation was responsible for the readiness of the team all fronts: chess preparation, psychological and physical training. Olympian Tebogo Pitlagano suggested that the trip was ill-advised and ill-considered. Botswana is one of the few African federations that can attract steady sponsorship, but the impact this result will have on future funding remains to be seen. Some fans were asking how Botswana qualified and how they could afford such a trip. These comments were imputable to sheer ignorance, but such a performance raises serious questions. Reports state that the women suffered from "stage fright" and in awe of the competition. Team coach Kefilwe Miti explained it this way. Firstly, this is a weak explanation since the sensation of awe would be overcome in a matter of rounds. Secondly, why would the team be surprised at the titles of their opponents? Did they not know of the strength of the teams invited to the tournament? Besides, Botswana has a WGM and WFM on the roster. If the team is implying that Tuduetso Sabure's title is not equal to other WGMs, then that is a different problem. If they are talking about the overall Grandmaster title, only Maia Chiburdanidze has earned it. Finally, players should know that one does not concern themselves about the opponents' titles and accolades… one has to play the board. This is a basic tenet in competition across the spectrum of sport. WFM Boikhutso Mudongo was unable to find answers. 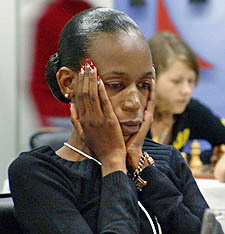 Photo by chesswomen.com. Part of the reason for the discomfort was due to lack of preparation. Competing in chess is like taking a major exam. The more prepared you are, the more confident you become. Lack of preparation brings out all type of insecurities at the board. Lack of preparation brings doubt… not a friend of successful chess. In looking at the games, the team did not appear to prepare for the players they were to face and seemed to get in trouble in well-known lines. What was even more amazing was that Sylvia Pilane Masego fell for the elementary trap 1.e4 e5 2.Nf3 Nf6 3.Nxe5 Nxe4 4.Qe2 Nf6?? 5.Nc6+ and played on without her queen until she was checkmated on move 18. As the tournament wore on, they began to lose confidence in their play, losing games very quickly. All of the players made gross tactical oversights including checkmates, two-move combinations and the loss of pieces. There was also a tremendous void in terms of opening theory. With so many tools available and with playing arenas like the Internet Chess Club (ICC), there is no reason that exposure to strong competition is not a regular part of training. If we look at this episode, we can learn a few things from it. The Botswana women players did not deserve to be tossed into a meat grinder to have their egos crushed. This was unacceptable and it laid a tremendous burden on the players in such a competitively tense situation. How must they have felt getting off the plane in Gaborone after losing all 36 games? Will they carry this devastating setback into the All-Africa Games in July? How can this damage be repaired? Since the reputation of African chess has been damaged by this event, there will have to be a concerted effort to repair the damage. How is this done? For Botswana, they should give the female players ICC accounts and let them play thousands of games against strong competition. There has to be allocation for intense training on opening theory. On a larger scale, federations must pool resources to attract more competition to Africa. Certainly, African federations cannot travel the world and play in tournaments for weeks at a time, but the federations can organize strong regional tournaments and attract strong players to play in them. I attended the International Academy for African Business Development conference recently in England and there was talk about how Africa should be marketed to attract investment? What is Africa's competitive advantage? There is no such thing as one characteristic to describe all 53 African countries. Many erroneously try to lump Africa into one group of common nations. Obviously, there are many qualities, but this will of course take some ingenious marketing continent-wide. While each country is different, what are some of the general qualities to make Africa an attractive place to play chess? The continent is price-competitive, African scenery is beautiful and diverse, the air quality is generally excellent, the food and entertainment are world-class, the people are friendly and the conditions are adequate in the major cities. Such an event would help move Africa out of chess obscurity and provide a training ground. Which country would I nominate for the initial task… Botswana.